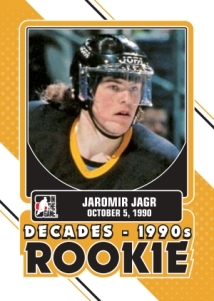 All right, stop, collaborate and listen -- 2013-14 ITG Decades The 90's Hockey cards take collectors back to a time when Jaromir Jagr's mullet wasn't a punchline, singing along with Vanilla Ice wasn't ironic and Pavel Bure wore roller blades on hockey cards. Focusing on many of the top players and fan favorites of the era, each box includes three autographs and three game-used memorabilia cards. The 2013-14 ITG Decades The 90's base set has 200 cards. Besides regular player cards, there are subsets that look back at Stanley Cup opponents, tough guys, players who were standouts on the international scene, coaches and top draft picks. Each box has six cards so building a set is a challenge. As noted, each box also has six hits. Autographs come with on-card signatures. Of the three promised game-used cards, one is guaranteed to be a quad memorabilia card. 2013-14 ITG Decades The 90's also has two basic insert sets. Decades Rookies spotlights some of the best players to make their NHL debuts during the decade. The 23-card checklist include Nicklas Lidstrom, Eric Lindros and Teemu Selanne. 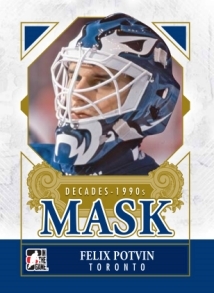 Decades Mask focuses on popular goalies like Patrick Roy, Felix Potvin and Tom Barrasso. Decades Mask has a 22-card checklist. Each of the basic inserts fall one per box. Click here for the complete 2013-14 ITG Decades The 90's checklist from the In the Game website. Good: Great nostalgia, on-card autographs, plain jersey cards that matter. Bad: Design feels more art deco that 90s, inserts are too plain. The Bottom Line: Line: What did Charles Dickens say about it being the best of times and the worst of times? That could easily sum up the 1990s in the hobby. On the one hand, it was a time of unprecedented growth. But there was also a monumental crash back to reality. But even as things were falling apart, the decade brought about a lot of change and innovation. For hockey, the decade brought about several stars, milestones and curtain calls. And for Canadian hockey fans, something called the Stanley Cup. 2013-14 ITG Decades The 90s does a great job of capturing the players and personalities of the decade. Some are all-time greats, others are small players in memorable moments. In that regard, the set is great. However, for a set that celebrates the 90s, it doesn't feel very 90s from a hobby perspective. Overall, I'm not a huge fan of the look of the set. Parts of it work well, especially the autographs. But for a set that explores a specific period, I'd expect the design to reflect that period. Instead, there's more of an art deco feel going on thanks to all the stripes. The base cards in particular look extremely busy but don't offer a lot. The color palette uses a lot of black. Because it's about the 90s, perhaps some brighter shades would have been more appropriate. The use of foil gives the base cards a bit of a premium feel, but it also undermines the inserts. I'd have preferred a switch or skip the foil altogether. One place where the foil really worked was in the Cup Clashes subset. The inclusion of the Stanley Cup in the background makes it both appropriate and attractive. ITG continues to make some of the most attractive memorabilia cards in the business, even when the swatches are as plain as a soda cracker. If you've collected the company's jersey cards in the past, the look and feel is familiar. While I always enjoy a fresh spin, these work. THe best looking cards in the product are the autographs. The on-card signatures, ample signing space and balance of the image size come together very nicely. The arena image in the background is a nice connection back to the era (along with the many mullets). If you're strictly about getting autographs of the biggest stars and all-time greats, you'll likely want to skip this set. They're in here, but so are a lot of smaller stars who don't carry much clout in the hobby. That said, these smaller players are like the bay leaf in a pot of homemade spaghetti sauce. It's not the main ingredient, but without it, things wouldn't taste nearly as great. Likewise, these smaller players helped write the story of the 90s. They were part of the memories. For example, I pulled a Gino Odjick autograph. He's a respected tough guy but not someone people spend large amounts on. Still, I was stoked to land him. The first NHL game I went to saw him score an unlikely penalty shot goal. I was there with my late-grandma and mother, sharing a moment even though we weren't the biggest Canucks fans. The joy is in the connection, not the value of the card. In this sense, I feel lucky. That said, if someone on out east landed the same card, they might not be so excited. I get that. But there's enough variety within the autographs that anyone who followed the sport back then should be able to appreciate some of the names strictly from a fan's perspective. If your motive are strictly flipping, you could end up disappointed, though. That said, the memorabilia checklists bring a lot more superstars and greats. So even if all three autographs are something of a letdown, this could make for something of a rebound. Three autographs and three game-used memorabilia cards for less than $100 is a very decent proposition, even if a lot of the signers are "commons" on the secondary market. But this is a niche product with a very narrow focus. Those commons are part of the equation. As mentioned, this isn't a product to be flipped. Collectors who look back fondly on the 1990s, the good and the bad, are the ones who are likely to appreciate this product best. Nostalgia is a powerful beast. 2013-14 ITG Decades The 90's takes you back to the players with a lot of depth. A lot of the fun comes in reconnecting with the memories and players, whether it's following a favorite player or sharing a couple of hours with a loved one and seeing a character player score an unlikely goal. It's in these reminders that the set really shines. The autos are a complete joke. Three per box of nobodys. Dont waste your money. There might not be a ton of big names, but I found with the box I opened I was satisfied as I could connect with 2/3 players I got. Wouldn’t get close to recouping costs, but wouldn’t be looking to either. Don’t let one review make up your mind. This product is collector-specific and is not just the same NHL players over and over again. If you didn’t watch hockey or collect cards in the 90s its not for you. If you did, it is. We make cards for collectors. Good: International appeal. Six hits per box. On-card autographs. Bad: Bland card design. Few major hits. The Bottom Line: Although there are six hits per box, at this price point, I would expect a little more out of this type of product. A nice thing is the fact that all the autographs are on-card. And one major element that ITG always delivers on is nice swatches of material for their game used cards. That trend continues in Decades the 90’s. Despite the mid-level pricing, the bland base cards feel more like a low-end release. The inserts are similar to previous ITG product, with lots of straight lines, and not much innovation involved. The basic game-used jersey cards have a very similar feel to the other ITG products as well. Themed jersey subsets like “European Influence” and “Franchises,” add some nice identity to the product. The quad “Franchises” are among the top memorabilia option and include jersey pieces from four players on one team. Adding a nice subtle addition, the background shaded by the team colors looks like the arena the team calls home. The on-card autographs are the nicest part of the hits, and also feature the team arena in the background. The base and insert cards include names that are expected. Mask inserts highlight the best goalies from this era, like Curtis Joseph and Patrick Roy, and the 90s Rookie inserts pay homage to the elite rookies from this era, such as Peter Forsberg and Mats Sundin. While the actual autograph checklist is solid, the product does seem to be heavy on low-end autographs. However, the odds of hitting a good game-used jersey seem to be higher. There is not a lot of monetary value here. But if you are a heavy player collector, or a huge fan of hockey in the 1990s, then this is a solid product. Be aware that ITG is not a licensed product, so team logos and names are not present. This product brings back memories of my teenage years. I grew up watching all of the guys in this product. I remember the Eric Lindros hype, and Jaromir Jagr and his mullet. This is also when I became a huge fan of Brett Hull, even though he never played for my beloved Bruins. The cards brought back very fond memories and was a fun overall break.